The landscape on your property is as important as every other space in your home. When you get these areas installed by experts like us, you can rest assured that your property will look more aesthetically appealing and become more functional as well. Every landscape has features such as plants, masonry elements etc. But many homeowners also like to add a unique touch to their properties and want water feature installations in the landscape. We at Emerald Creek Landscapes, LLC are a well-established company in the landscaping field and have been serving customers in Ringgold, East Brainerd, and Fort Oglethorpe. Our experts have successfully completed a large number of water feature design and installation projects across East Ridge, Dalton, Chattanooga and Red Bank as well. We have also catered to customers in Middle Valley, Cleveland, Soddy-Daisy, Calhoun and the surrounding areas and created beautiful hardscaping elements on their properties. 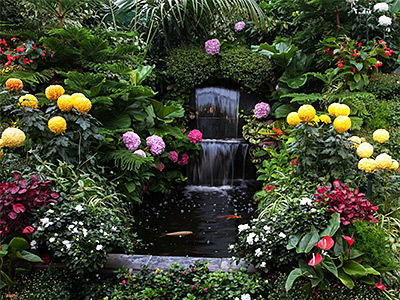 We handle end to end landscaping projects and many of our clients want a waterfall, fountain or pond installed in their yard as part of this job. If you want a water feature installed in an existing landscape, we can do that as well. Our expert designers work very closely with you to understand what your specific requirements are and they take into account the styling of the landscape and features in it while designing a custom water feature for you. Waterfalls - Many people like a waterfall in their landscape. Since this structure will be specifically designed for your yard, you can choose the size, styling, materials etc. that go into it. A rock waterfall when built at a strategic point in the landscape can also become the perfect privacy screen on your property. Fountains - These are also very popular features and we can design and install a stone fountain for your landscape. Sometimes, homeowners center the design of the entire yard on the fountain installations. If you have a larger landscape, you can opt to get more than one fountain built as well. Ponds - These installations lend a very unique look to a home. We can build a Koi pond for you and add fish and aquatic plants of your choice to it. These elements require more maintenance and care than the other features and it’s something you need to keep in view while opting for a pond in your landscape. Streams - A stream creates a very natural look in the landscape and we can also add this to a waterfall feature if you like. The stream can meander through various areas of the landscape and creates a very quaint look in the outdoor spaces. With the vast experience and expertise we have developed over the years, we know what it takes to provide excellent solutions at very competitive water feature cost. For any more information on our services or to discuss your project details, feel free to call Emerald Creek Landscapes, LLC at 423-593-5443. You can also send us your queries and project details via this online form.